January 1 – January 8. This is what the Comer Channel looks like in our chart book. The circles with crosses in them are way points. The magenta line between each way point is the path we follow. The black numbers are depths in meters at low tide. We draw 6 feet which about 1.8 meters. We will shallow water for 12 miles or at our usual pace, about 2.5 hours. The different colors on the chart show different depths of water. Yellow is extremely shallow water/dry at low water. White is shallow. Light blue to dark blue is the deeper water we prefer to sail in. As you can see veering either way off the Comer Chanel we are in very shallow water. Quickly I jump behind the wheel so Greg can go below and investigate. He grabs the fire extinguisher and pulls the cover off the engine compartment. From behind the helm I see smoke rise up out of the cabin. “Throttle down!” Greg yells. I do and the engine stalls. And I thought it was going to be an uneventful day. It started off calm, very calm. There was barely a puff of breeze in the air. But this was ideal since we had a mile and a half row to shore to do our laundry, catch up on some blogging, and fill up some water cans before we headed out on our next adventure, south to the remote and barely populated Jumentos Cays. We had spent the last week anchored in Thompson Bay, Long Island deciding when to start this next story in our Bahamas journey. Our short wave radio weather god, Chris Parker, kept predicting cold fronts, so as we waited for each one to pass we spent some time ashore doing chores (taking in trash, buying fuel, and helping the local economy by visiting a few watering holes). On the boat we defrosted the fridge and cleaned the head. Finally a weather window appeared in our calendar. Next, we need to figure out when we wanted to transit the Comer Channel. The Comer Channel is a long, unmarked, shallow channel that zigs and then zags from the banks off of Long Island to the eastern part of Great Bahama Bank that extends south of the Exumas into the Jumentos. The best time to make this passage is at high tide, but the tide was only peaking in the middle of the night or the middle of the afternoon during our weather window. We quickly ruled out traveling in the middle of the night, due to darkness and sleep deprivation issues, and started to consider going in the afternoon. The distance to the first good place to drop the hook in the Jumentos is about 40 miles from Thompson Bay. If we sailed the Comer Channel in the afternoon and continued to this anchorage we would arrive after dark. Our guide book suggests that this is dangerous. Our other option was to anchor on the other side of the channel on the banks below Little Exuma. Our guide book describes this option as potentially uncomfortable. We decided to go with uncomfortable. As we returned to Blue Wing with our clean laundry and cans of water the afternoon of our departure, only a light breeze blew over our bow, so we raised the main, throttled up,and motor sailed out of Thompson Bay. I thought we would be motoring the whole way, but fortunately, our sails filled with a steady strong wind just as we approached the first way point for the channel and our engine decided to take up smoking and stalled. We continued to sail until the wind started to slacken, causing us to try motoring again. Greg stood below with an eye on the engine as I cranked her up. “Turn her off!” Greg hollered. The new belt was intact, but we were still over heating. The wind soon picked up once again and we were making good speed averaging 7 knots. It was getting late and we were starting to worry about making it to our destination in the daylight, because although we had anchored in the dark plenty, we had never dropped the hook without the aid of the engine. But, of course, having no choice is the best way to learn something new. Once out of the channel we headed up towards the south side of Litte Exuma. The sun was setting as we neared the island, but the soft light of dusk still lingering as we headed up into the wind, dropped the main sail, dropped the anchor, and let the strength of the wind stretch out the chain and firmly set the hook into the sea floor. The anchorage was not all that uncomfortable. We were in the lee as the wind blew from the Northeast. Blue Wing gentally rocked. But sometime after we went to bed the guide book warning came true and waves started surging from due east and the boat pitched and rolled all through our sleepless night. The next morning Greg diagnosed our engine’s smoking problem – lack of antifreeze. He filled her up and this time when we fired her up she had given up that bad habit of smoking. After breakfast and a few chores we headed out again, looking forward to a dull day as we headed south into the Jumentos. This entry was posted in Life on the Water, Long Island, The Bahamas, The Exumas. Bookmark the permalink. Greetings from Georgetown, wind was on the nose all day but what a great place! Great meeting you two at farmers cay. I like your website. Keep posting. Hope I meet you guys again somewhere. Great meeting you Robert! Glad you like the blog. We will keep an eye pealed for you along our travels. How did you determine the time for the high tide in the Comer Channel? It seems like the only tide station is Nassau though there is one in Clarence Town but I would think that would be way off due to it being on the east side of Long Island. Any help you can give would be appreciated. Hi Marcus! 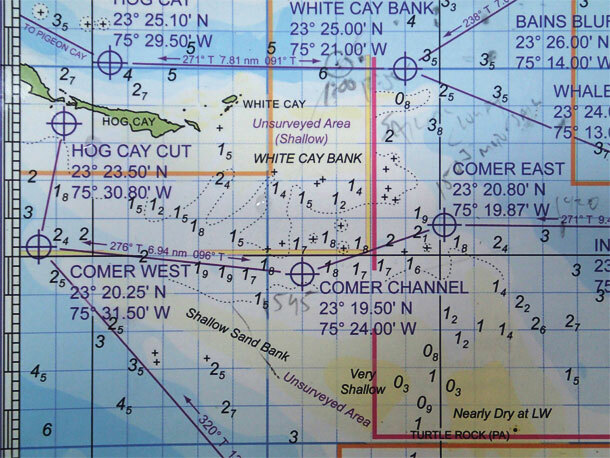 Our trip through the Comer Channel was 2 1/2 years ago, so I am sorry to say that I don’t remember exactly how we determined high tide – but I imagine we used the Bahamas Explorer Chart Book. This book lists high tides for different areas based on hours before or past high tide in Nassau. I imagine we had high tide for Thompson Bay and guessed high tide for the Channel would be close. We transited the Comer Channel three times that season and never had a problem even though we draw 6 feet. You might also just want to seek out a little local knowledge. Many Long Islanders fish in the Jumentos and are probably familiar with the tide level in the Channel. Thank you for your reply. In the end I will probably get the answer to my question when I arrive in Nassau or the Exumas. I will be transiting from Little Exuma to Long Island.